Research on drug release materials is increasing due to the high demand to improve their efficacy decreasing their cost. This approach allows us to administrate a pharmaceutical compound to achieve a therapeutic effect, delivering the drug to the right area, at the right time and at the right concentration. It is important the maintenance of prescribed drug concentration at the desired tissue during the treatment and prevent the side effects on the rest of the body. Several approaches are currently being researched to increase drug efficiency, avoiding the low solubility, and environmental or enzymatic degradation. Then, drugs may be reformulated or smart nanomaterials could be designed to be used as drug delivery systems. The smart materials are designed to release the drug on target tissues, and nanotechnology offers a lot of possibilities. The activation of these systems could be carried out by changes in physiological conditions such as pH, osmolality, temperature; or could be also magnetically activated using magnetic nanoparticles. Nowadays, magnetic nanoparticles are used for clinical therapy combining the magnetic hyperthermia with chemotherapy to achieve a synergistic effect. In this case, magnetic nanoparticles are used as nanoheater increasing the temperature of target cells to 41–46◦C to induce the cell death. The heating during magnetic hyperthermia is based on the energy absorbed by the magnetic nanoparticles when are placed under the influence of a low-frequency (i.e., 100 kHz–900 kHz) alternating magnetic field (AMF). Particles are able to transform the energy of the magnetic field into heat due to their intrinsic properties by different physical mechanisms, depending also on the agglomeration state and viscosity of the surrounding medium. Similarly, these properties are interesting to activate biomaterials to release the drug on the target site. Here, we pretend to summarise the most relevant delivery platforms activated by an alternating magnetic field (AMF). The interesting facts of magnetic nanoparticles (MNPs) are related to surface chemistry, size (magnetic core, hydrodynamic volume, and size distribution), and magnetic properties (magnetic moment, remanence, coercivity). The size opens a lot of possibilities for drug delivery using the engineering techniques to modify the particle’s surface to develop high selective vectors. Superparamagnetic nanoparticles could be visualized by MRI. Magnetic nanoparticles could be guided by controlled magnetic field gradients. Magnetic nanoparticles could be heated in presence of an alternating magnetic field. The size of nanomaterials present a larger surface-to-volume ratio presenting a larger contact area of the drug with the body, increasing the effectiveness at the same concentration. These nanomaterials can be synthetized by organic based (e.g. polymeric nanoparticles, magenetoliposomes, micelles or ferrrogels) and inorganic based (e.g. Au@magnetic nanoparticles). Current research is conducted to modify physicochemical properties to improve the interactions of these materials with the biological systems in our body reducing side effects like intrinsic toxicity and immunogenicity. Magnetic nanoparticles are often coated with a polymer in order to increase the colloid stability in biological environments, and improve the biocompatibility. Furthermore, their surface can be functionalized with targeting agents, fluorescent markers, or loaded with drugs (see Figure 1). When MNPs are placed on presence of a low frequency AMF, the controlled release of the drug could be produced in the target tissue. This process can be combined with the local magnetic thermotherapy to induce synergic effects. 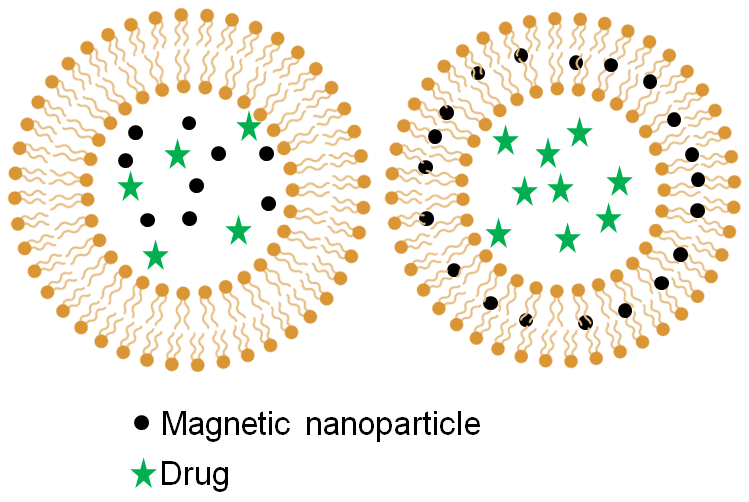 Liposomes (100–200 nm in diameter) present advantages as biocompatibility and enable transport of hydrophilic compounds in their large aqueous lumen as well as hydrophobic and amphiphilic drugs in the lipid bilayer. The composition and functionality of the lipid membrane can be easily tuned to provide specific interactions with particular tissues or cells. Thermoresponsive liposomes are designed to carry out structural changes when they are exposed to temperature variations. Then, liposomes can be decorated with magnetic nanoparticles (see Figure 2) to activate them remotely by an alternating magnetic field (AMF). Micelles are formed by self-assembly of amphiphilic block copolymers (5-50 nm) in aqueous solutions where the drugs are entrapped inside of block copolymer micelles (see Figure 3). When these kind of structures are self-assembled into a solution with hydrophobic drugs and MNPs, their encapsulation can be carried out. Figure 3. 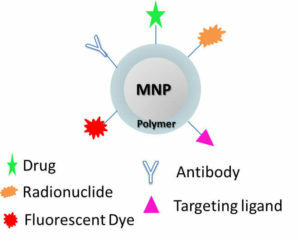 Scheme of magnetic micelles encapsulating drug and magnetic nanoparticles (MNPs). Ferrogels are made by magnetic particles collected in a hydrogel’s thermoresponsive polymer matrix. Ferrogels can be activated to release the drug by low frequencies as a result of heating magnetic oxide particles (see Figure 3). Efficiency can be enhanced by designing the internal gel and optimizing the magnetic nanoparticle properties. Thermoresponsive polymers are a class of materials that change their internal structure with temperature. This property makes them useful for biomedicine. One of the polymers most common is poly(N-isopropylacrylamide) (PNIPAAm) which presents a critical temperature around 32°C. This temperature could be adjustable by copolymerizing with hydrophilic or hydrophobic monomers rendering the overall hydrophilicity of the polymer higher or lower respectively to be close to the body temperature (37°C), and therefore be useful for biomedical applications. Thermoresponsive polymers are characterized by lower critical solution temperature (LCST) and upper critical solution temperature (UCST) which represent the temperature points below and above where the polymer and solvent are completely miscible, because it is energetically more favorable. Figure 4. Scheme of ferrogel activated remotely by an alternating magnetic field (AMF). Gold nanoparticles (Au@MNPs) can also be used as drug release system due to their low cytotoxicity, biocompatibility and low immunogenicity and tunable surface functionalities. [12, 13] Au@MNPs could be functionalized using thiol linkers with a functional group, as amine, at the other end group of the molecule. Furthermore, these particles can be coated with polymers, biomolecules, cationic monolayers and peptides (see Figure 5). Figure 5. Scheme of Au@MNPs functionalized. Mesopoprous silica nanoparticles are really attractive to biomedical applications, and techniques to decorate MNPs with silica are widely reported in the literature. Coating with silica is difficult due to its amorphous structure which may hinder its growth on the MNPs surface. The size and shape of MNPs does not change very much when the silica layer is formed (Si@MNPs). Mesoporous silica materials are characterised by a huge surface area which allows a high loading capacity for therapeutic agents. Furthermore, Si@MNPs can be attached to thermoresponsive polymers trapping the drug (see Figure 6). Then, the release could be activated by a low frequency AMF on the target area. Figure 6. 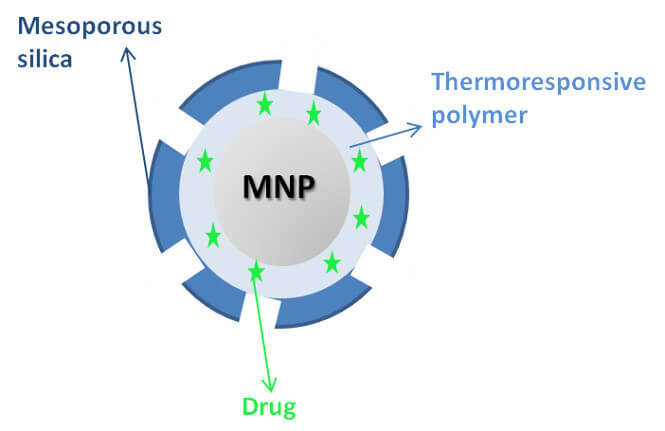 Scheme of magnetic nanoparticle (MNPs) coated with a thermoresponsive polymer and mesoporous silica encapsulating a drug. Magnetic drug release is a promising therapy to treat cancer. The future engineering of nanoparticle drug delivery systems will be focused on increasing the efficiency and maximizing the percentage of the drug reaching the target site. This requires new designing of nanoparticle formulations and smart materials, reducing the side effects. To improve the controlled drug delivery, specific molecules, ligands or linkers have to be used to reach the target tissue, decreasing the cytotoxicity in healthy cells. Furthermore, nanocarriers are interesting as therapeutic agents improving properties as poor solubility, instability or adverse side effects. Thus, these new lines of research are committed to significant advances in magnetic drug release systems. Golovin, Y., et al., Modeling drug release from functionalized magnetic nanoparticles actuated by non-heating low frequency magnetic field. Journal of Nanoparticle Research, 2017. 19(2): p. 64. Ward, M.A. and T.K. 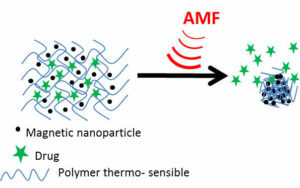 Georgiou, Thermoresponsive Polymers for Biomedical Applications. Polymers, 2011. 3(3): p. 1215. Tiwari, G., et al., Drug delivery systems: An updated review. International Journal of Pharmaceutical Investigation, 2012. 2(1): p. 2-11. 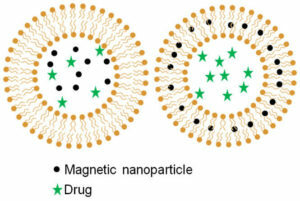 Arruebo, M., et al., Magnetic nanoparticles for drug delivery. Nano Today, 2007. 2(3): p. 22-32. Zamora-Mora, V., et al., Chitosan nanoparticles for combined drug delivery and magnetic hyperthermia: From preparation to in vitro studies. Carbohydrate polymers, 2017. 157: p. 361-370. Goya, G., V. Grazu, and M.R. Ibarra, Magnetic nanoparticles for cancer therapy. Current Nanoscience, 2008. 4(1): p. 1-16. Hauser, A.K., et al., Magnetic nanoparticles and nanocomposites for remote controlled therapies. Journal of Controlled Release, 2015. 219: p. 76-94. Bixner, O. and E. Reimhult, Controlled magnetosomes: Embedding of magnetic nanoparticles into membranes of monodisperse lipid vesicles. Journal of colloid and interface science, 2016. 466: p. 62-71. Tiwari, G., et al., Drug delivery systems: An updated review. International journal of pharmaceutical investigation, 2012. 2(1): p. 2. Tietze, R., et al., Magnetic nanoparticle-based drug delivery for cancer therapy. Biochemical and biophysical research communications, 2015. 468(3): p. 463-470. Kennedy, S., et al., Improved magnetic regulation of delivery profiles from ferrogels. Biomaterials, 2018. 161: p. 179-189. Lazarus, G.G. and M. Singh, In vitro cytotoxic activity and transfection efficiency of polyethyleneimine functionalized gold nanoparticles. Colloids and Surfaces B: Biointerfaces, 2016. 145: p. 906-911. Capek, I., Polymer decorated gold nanoparticles in nanomedicine conjugates. Advances in Colloid and Interface Science, 2017. 249: p. 386-399. McBain, S.C., H.H. Yiu, and J. Dobson, Magnetic nanoparticles for gene and drug delivery. International journal of nanomedicine, 2008. 3(2): p. 169. Zhou, Y., et al., Mesoporous silica nanoparticles for drug and gene delivery. Acta Pharmaceutica Sinica B, 2018. Shen, B., et al., Fabrication and potential application of a di-functional magnetic system: magnetic hyperthermia therapy and drug delivery. CrystEngComm, 2016. 18(7): p. 1133-1138. Lee, B.K., Y.H. Yun, and K. Park, Smart nanoparticles for drug delivery: Boundaries and opportunities. Chemical engineering science, 2015. 125: p. 158-164. Ding, C. and Z. Li, A review of drug release mechanisms from nanocarrier systems. Materials Science and Engineering: C, 2017. 76: p. 1440-1453. If you are considering getting instrumentation for magnetic heating of nPs, magnetic hyperthermia or magnetically controlled drug release, we encourage you to read on. 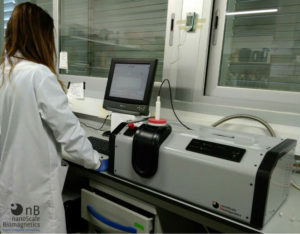 Heating nanoparticles using alternating magnetic ﬁelds has become increasingly more commercially relevant every year so in the spring of 2011 nB introduced the concept of the DM100 Series product to the scientiﬁc community; our intention was to learn from the scientist’s requirements and to make instrumentation that evolves with its users.